Singer Lita Bembo led up one of my very favorite bands, Orchestre Stukas. The Stukas made one album that I know of without Lita Bembo, BALLADE A LIBREVILLE. 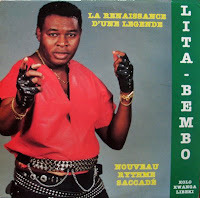 In the mid 1980s, Lita Bembo made at least two solo albums in Europe on which he was backed by musicians other than the Stukas. One of these albums, CONFLIT, was cut in Brussels and it is a pretty good record. 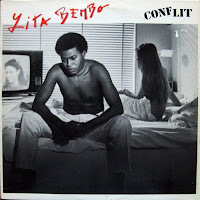 Lita Bembo, as a singer, and his music are both very true to the music for which he was beloved in the former Zaire. The other musicians on the album are only listed as being other scandalously unnamed Zaireans from Brussels assisted by named Belgians. The keyboards on this album are replaced by a synthesizer and it is brought farther into the foreground than we would have heard keyboards with the Stukas. Played by Roland Dechamps, the synth carries some wild and wonderful riffs that I believe were intended to reflect the original Stukas sound. 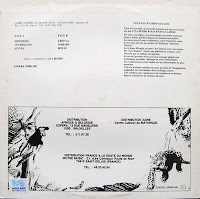 The other European album, NOUVEAU RYTHME SACCADE, is touted on the sleeved as being "La Renaissance D'Une Legende", but it is a much less successful album. Well, let me know what you think. I am particulary critical of the NOUVEAU SACCADE album. 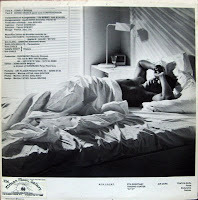 They are, by the way, solo albums by Lita Bembo and the Stukas were not involved. The Saccade album definately lacks the exuberant Stoukas touch, and sounds like a formulaic generic Congolese CD without distiction. I have yet to listen to the other one. The new saccade album is nothing like the original saccade album. Now THAT was music! At one time, comments appeared immediately. I had a problem with spam, though, so now I have to moderate them. Sorry for the inconvenience. I'm sad to be late in your blog so i have miss those two sessions of stukas. Can you put it again if possible? Thank you. JB MPIANA & WENGE MUSICA deliver in DC! JB MPIANA in DC tomorrow night!